Up near dawn, ate breakfast and broke camp by 7:00. It was a very nice morning to ride. 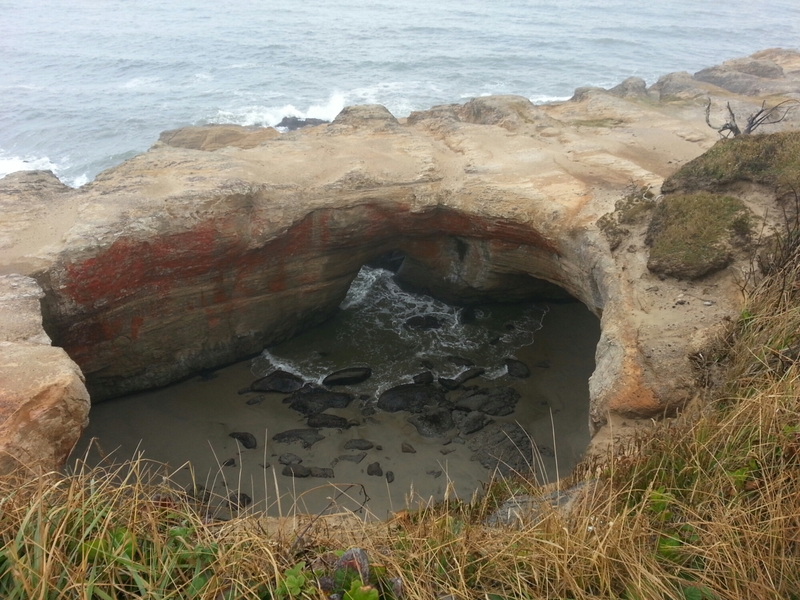 On the road for less than a mile, there was a side trip to Otter Rock and the Devil’s Punchbowl. There were no otters and the punchbowl wasn’t punching, not high tide I guess. The road climbed up along Cape Fearless. Nice view. 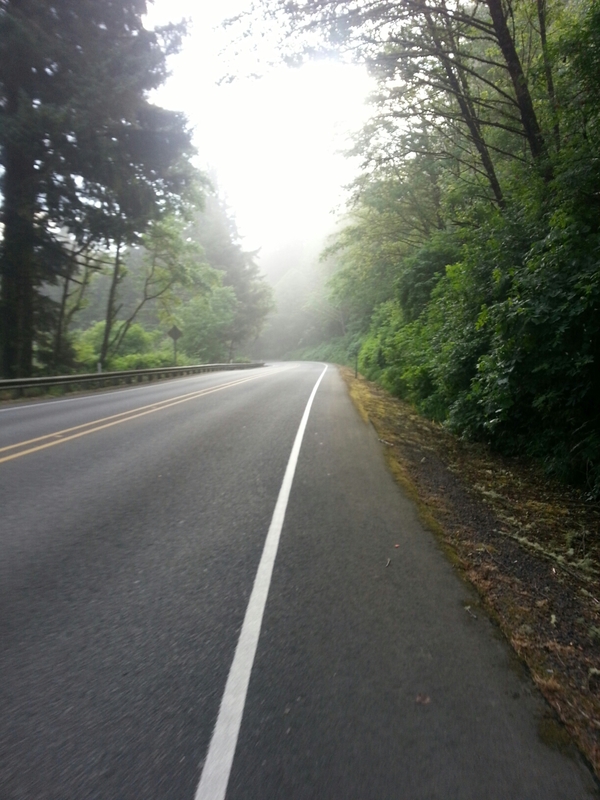 It was really soothing to ride without traffic and with a canopy of trees with light fog drifting across the road. 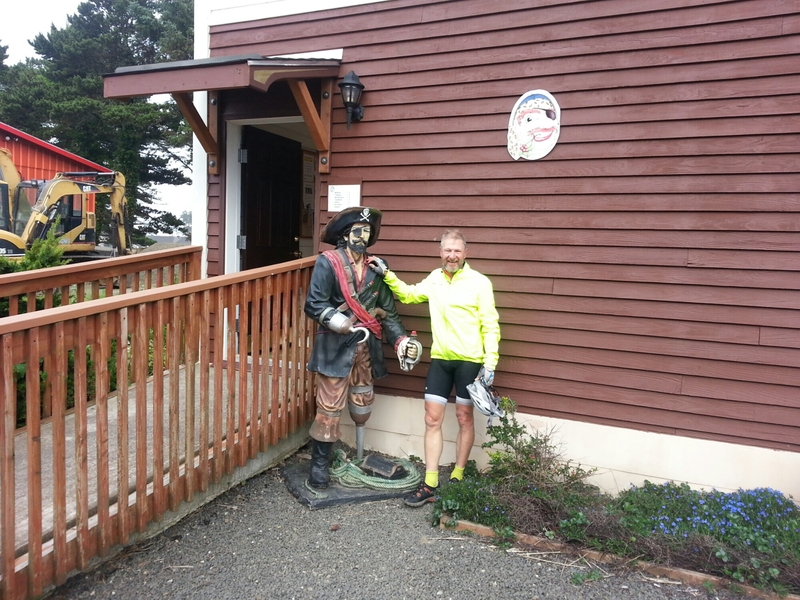 The first town was Depoe Bay, claim to fame, World’s smallest deep water port. What drew my attention was the Pirate Coffee Company. I stopped in and had a chocolate chip scone the size of a slice of pie, and made a new friend. The riding was good, perhaps a tailwind?? Lincoln City was busy, roads under construction and it was hostng a kite festival, couldn’t get past it fast enough. The tour detoured off of the 101 to Old Scenic Hwy 101. Hint: when the map says scenic, get out your camera, and your climbing legs. 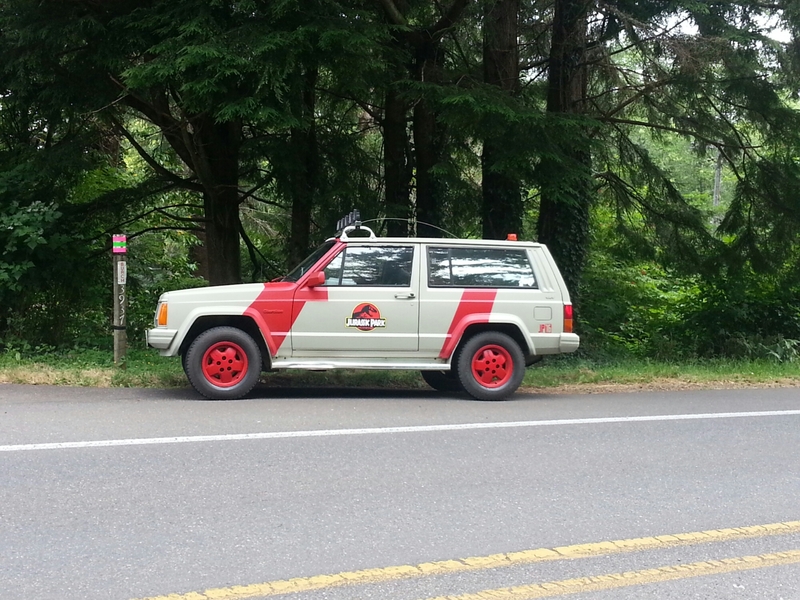 This is for Bob, a Jurassic Park mail truck. 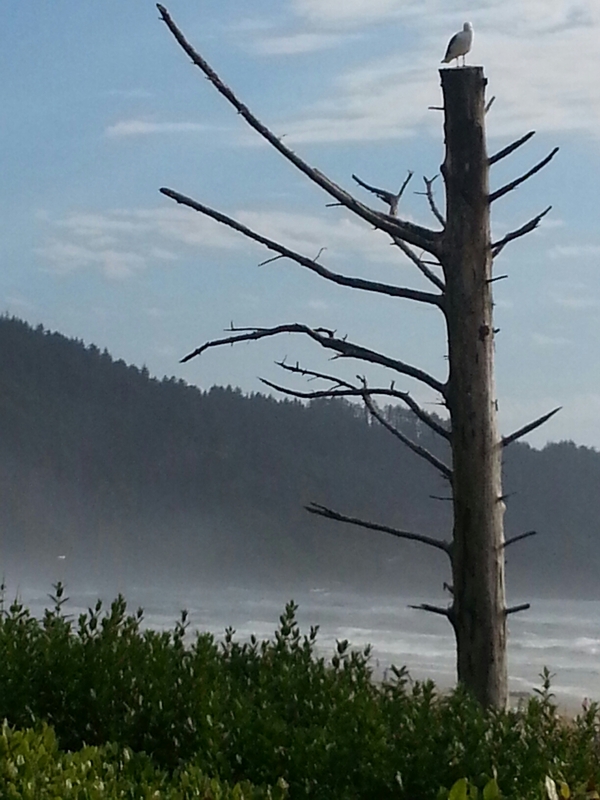 The drop down from the climb takes you to Neskowin. Good fortune, farmers market Saturday. I got some Ranier Cherries and a dory caught Ling Cod sandwich from the dory fisherman. A great surprise bonus lunch. That meant I could ride last Pacific City, where I had intended to stop. I stopped anyway because the whole town was a traffic jam as everyone in Portland was there trying to avoid the triple digit heat. There was Slingball (the game where you toss little bolo’s and try to get then to wrap around a little ladder) tournament to support MS. 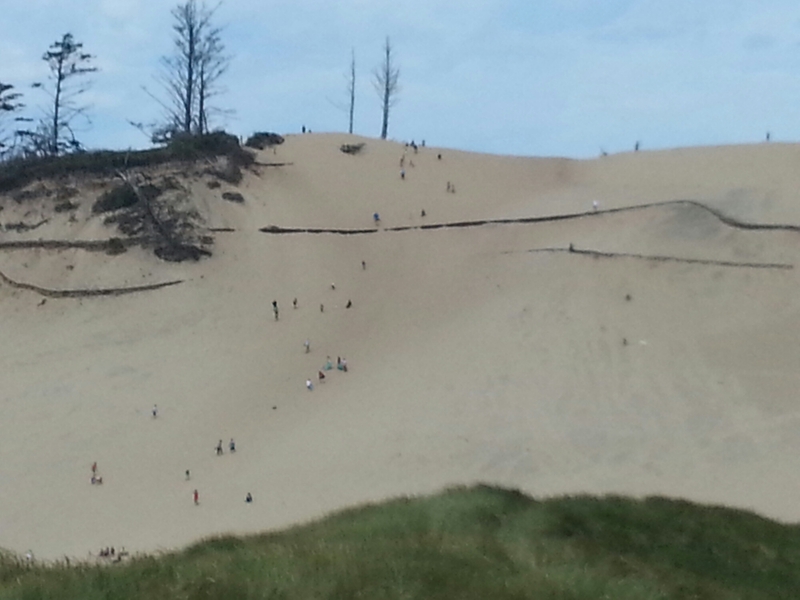 There were sand surfers on a huge dune. Those are people, not ants. 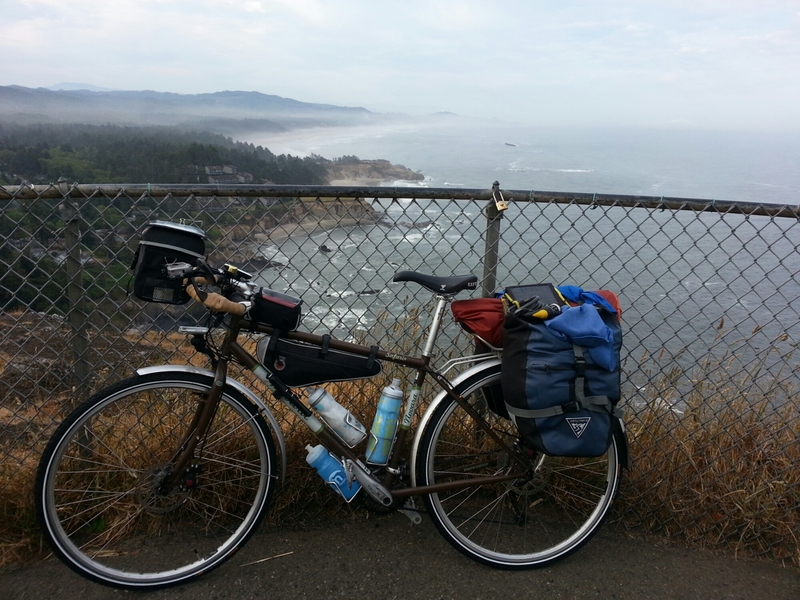 I rode the last climb to Cape Lookout, our home for the night. I got in about 3:00 and spent a couple hours on the beach, nice. The park and beach were full. It seemed like most were speaking some eastern European language, possibly Russian. Things didn’t settle down until 9:00 when the day-use people were ushered out. There were 15 campsites for hiker/bikers under tall pines. I had to eat covering my food to keep the pine needles that were falling like rain out of my freeze dried three cheese lasagna.